Luis Suarez, the Uruguay striker who has emerged as the most controversial figure of the World Cup, has called on his team-mates to "play to the death" to secure the prize of third place in the tournament. 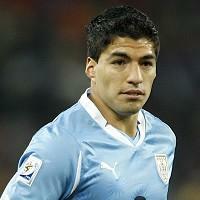 Uruguay face Germany in Port Elizabeth in the third-place play-off. The match has had a reputation for being an almost meaningless consolation prize but Suarez, whose last-minute handball against Ghana prevented the Africans from going through to the semi-finals, insists Uruguay will take enormous pride from coming third. Suarez said: "For this squad, the World Cup is not over yet. Now what's left is to play to the death for third place." Notice: Please subject to GMT+0800 if there are no other time zones marking in our info. Copyright © 2003 - Power By www.7m.cn All Rights Reserved.